Experience and an over-active imagination feed the Markus Fanger adventure crimes. "My fictional protagonist, Markus Fanger, a former detective with Kripo Hannover, reflects what makes us northerners. A love of nature steered him into wilderness guiding for German-speaking visitors after he immigrated to the territory. Like so many before him, Fanger’s been indelibly touched by the Yukon’s “magic and mystery”—often more mystery than he bargains for." Whether the case involves terrorist saboteurs, stolen artifacts, or missing tourists Fanger has the training, language and bush skills that make him a valuable auxiliary member of the Royal Canadian Mounted Police “M” Division. 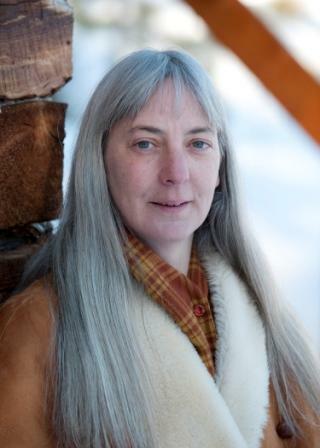 Jessica has called the Yukon home for over twenty years, working as a journalist and editor, executive assistant for a ministerial Member of the Yukon Legislature, co-ordinator of the Whitehorse women’s center, typesetter, bookbinder, first aid instructor, and wilderness guide before exchanging her paddle for a pen. Sideways — Honorable Mention — Santa Barbara Writers Conference 1000-word non-fiction theme contest — 2008. Washed Out — Winner — Dawson City’s Authors on Eighth prose competition judged by Robert Sawyer. 2009 - present: World of Words literary columnist for What’s Up Yukon. 2006 - present: Contributor to Yukon North of Ordinary — iRun Nation — San Francisco Chronicle Magazine — Sled Dog Sports — Get Out There Magazine (Ontario edition) ultraRUNNING Magazine — Outdoor Edge — Blueline — 24/Seven — Yukon News. “Northern Wedding”, pg. 97 Another Whole Lost Moose Catalogue; 1991; Lost Moose Publishing; Whitehorse, Yukon; now Harbour Publishing, B.C. “I’ve got a Boyfriend” and “The Struggle to be Woman” in Poetry Prose Theory & Art literary review; Spring 1986; Carleton University Women’s Centre.